The Cherokee Indians live in many parts of the United States, but more than 100,000 live in parts of Oklahoma. Many Cherokee have moved elsewhere. In the 1800's, the Cherokee Nation was one of the strongest Indian tribes in the United States. They were part of the Five Civilized Tribes. The Cherokee Nation began to adopt the economic and political structure of the white settlers in the early 1800's. They owned large plantations and some even kept slaves. The Cherokee Nation was a form of republican government. A Cherokee Indian named Sequoya introduced a system of writing for the Cherokee language in 1821 also. White settlers began to protest the Cherokee's right to own land in the early 1800'. They demanded that the Cherokee Nation be moved west of the Mississippi to make room for white settlers. Some members of the Cherokee Nation signed treaties with the government in 1835 agreeing to move to designated areas in Oklahoma. Most of the tribe did not want to be relocated so they opposed the treaty. But most of the Cherokees, led by Chief John Ross, were forced to move to the Indian Territory in the winter of 1838-1839. More than 17,000 Cherokees marched from their homes to Oklahoma. This march was called the Trail of Tears. Many Indians died on this journey. Even though most of the Cherokee nation had been forced to move, more than a 1,000 Cherokee escaped and remained in the Great Smoky Mountains, which is in parts of Tennessee and North Carolina. These tribes became known as the Eastern Band of Cherokee. The Cherokee who went west reformed the political system that they had before. The Cherokee Nation set up schools and churches. But all this progress was stopped in the late 1800's. Congress voted to abolish the Cherokee Nation to open yet more land for settlement by whites. Today most of the Cherokee remain in northeastern Oklahoma, where they have reestablished their form of government. 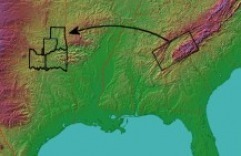 Before the Trail of Tears occured the Cherokee people were located in present day Georgia, Tennessee, and North Carolina. When they were told to leave their land over sixteen-thousand of them refused and stood their ground. John Ross, the chief at the time, split the tribe into two groups. thirteen in each of them and thirteen doctors as well. Even though they had many doctors at least 4-5 people died everyday from fever, pneumonia, or tuberculosis. 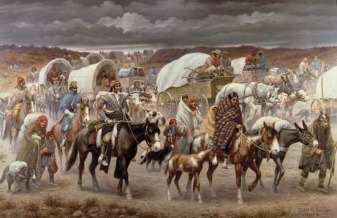 Many of the natives were supersticious and remembered the words of their previous elders before John Ross who said that "Where the Earth and Sky meet in the West meant death," most people assume that they were talking about the coming of the Trail of Tears.